While going back to history, the populations of Kathmandu Valley were not high, so, government was not too much concern about providing drinking water supply to the people in Kathmandu Valley. During that period, people used to take water from the available natural sources near their homes. However, because of population growth due to both natural growth and in-migration from other districts, the existing available resources were not enough to feed the people and thus, government realized to provide drinking water for the people in the Kathmandu valley and thus established a systematic development of water supply system with the name PANI ADDA (PANI GOSWARA) unit in 2029 BS. The organization has been restructured from time to time in order to provide the better service delivery to the customer. Following were the statutory development records of this organization. Nepal Water Supply Corporation (NWSC) is a public utility organization; an autonomous government body formed under Nepal Water Supply Corporation Act 2046 BS. NWSC is under the ministry of Urban Development. NWSC provides its services to the 20 cities within the country. Out of the 3 were sub metropolitan city, 16 were municipality and remaining 1 is VDC. Following tables shows the service area of NWSC. Therefore, the service coverage of NWSC in different cities of the country is 20 cities as in figure 1. The district pointed with dot mark was the service cities of NWSC. 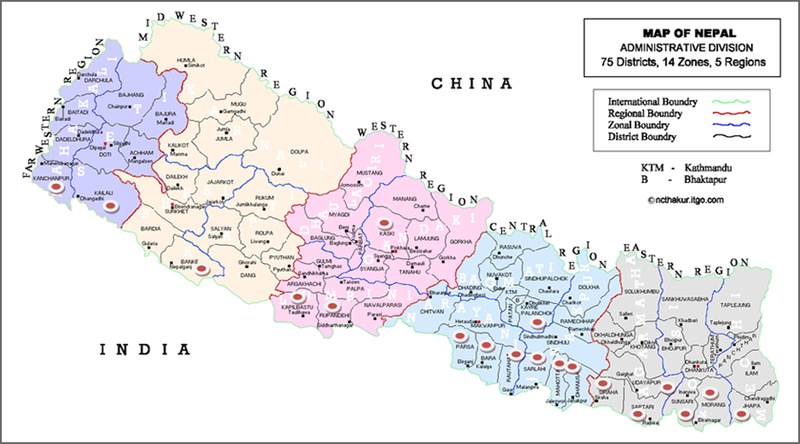 Service district of NWSC were marked with red point marks in the map of Nepal below.